As Originally Published by Journal of the Society of Tribologists and Lubrication Engineers, May 1988. All metalworking-fluid formulations share the common problem of susceptibility to microbial attack. This is not all bad news, since we need the used dilute fluid to be biodegradable for disposal purposes. However the challenge for both formulators and metalworking facility operators using water-based fluids, is to minimize the adverse economic impact of uncontrolled microbial contamination in metalworking operations. The following discussion will focus on water extended fluids. 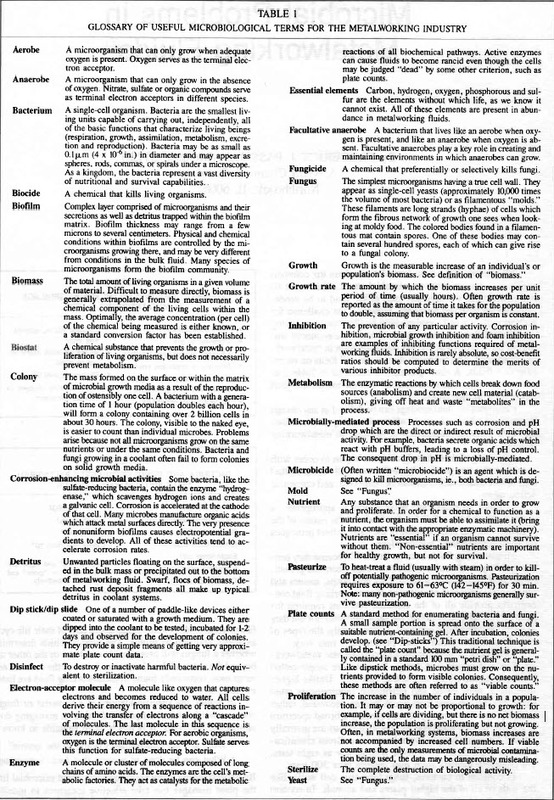 A short glossary is provided in Table1 to assist he reader who is unfamiliar with the microbiological terms used in this article. Metalworking fluid spoilage can be defined as any change in the fluid which adversely affects its utility. Table2 lists the most common indications of spoilage in metalworking fluids. When any of these listed problems begins to occur with a coolant that has previously performed well, uncontrolled microbial contamination should be suspected and corrective action taken. 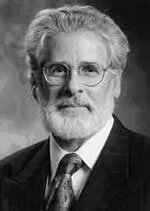 In order to determine what action is appropriate a manager must have a feel for the fundamental nature of the problem. We will discuss some of the more salient principles of metalworking-fluid microbiology. Metalworking fluids become" rancid" because they contain rich blends of nutrients that encourage microbial growth. Mineral oil bases tocks glycols fatty acid soaps amines and other nearly universal constituents of metalworking fluid concentrates provide all of the essential nutrients required for growth. Not all fluids contain the same nutrients nor are they used under identical conditions. Consequently the types of microbial contaminants which predominate may vary. In contrast to bacteria, fungi have true cell walls, like the cells of all of the higher plants and animals. In coolant systems, fungi may appear as single-celled yeasts or as filamentous molds. Many fungi spend part of their life cycle as yeasts and part as molds. The factors which determine whether a fungus will propagate in one form or the other are beyond the scope of this discussion. 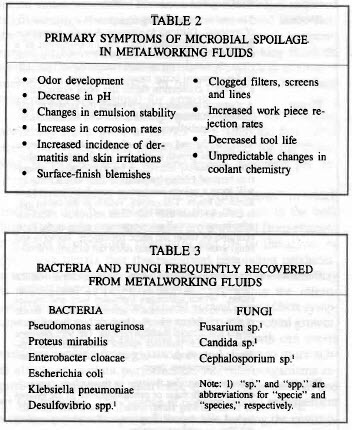 Some of the bacteria and fungi most commonly found in metalworking fluid are listed in Table 3. What are the contaminants doing to the system? What can be done to prevent that from happening? Microbiologists concerned with spoilage prevention try to define microbial activities. Populations can be defined by their impact on the coolant or system. Table 4 lists some microbial activities that can be monitored in metalworking fluids and methods used to measure these activities. Gross observations of the phenomena listed in Table 2 are also important for monitoring microbial activity. Control is achieved by taking measures which will minimize the rates at which these microbially-mediated adverse processes occur. Four factors predominate in controlling microbial life: an energy source, nutrients, and acceptable thermal and pH conditions. Energy comes either from light, as for photosynthetic microbes and plants, or from the breakdown of oxidized organic molecules. The pathways involved in energy metabolism require molecules such as oxygen, sulfate or specialized oxidized organic molecules which can act as lrwis acids (i.e., molecules which tend to accept electrons in a chemical reaction) to drive the process along. These molecules accept the electron liberated at the end of a cascading series of oxidation- reduction reactions and are consequently called "terminal electron acceptors." Cells of all higher life forms (including the fungi) use oxygen as their terminal electron acceptor. Aerobic bacteria require oxygen for energy metabolism. However, anaerobic bacteria cannot grow in the presence of oxygen. Some species use sulfate, others use nitrate, but most anaerobes use "high energy" organic molecules as their terminal electron acceptors. The four-carbon organic acid, fumarate, is one such molecule. Facultative anaerobes grow whether or not oxygen is present. When oxygen is present, they use it just as other aerobes do. When oxygen becomes depleted, they shift to an anaerobic mode of metabolism. Thus, they play a critical role in creating hospitable environments for odor and corrosion enhancing microbial activities, which occur principally under oxygen-free conditions. Typically, growth rate and metabolic activity increase as temperature increases, up to a point. (Living microbes have been recovered from Arctic ice and from deep-sea vents where temperatures exceed l2UC (248oF)). Further temperature increases inactivate enzymes and cause rapid die-off. The temperature at which die-off occurs is species-specific. Thus, pasteurization (brief exposure to 61-630C (142-1450F)) inactivates most common pathogens, but prolonged superheated steam treatment (15 min at l2l0c (2500F)) is required to kill many of the species commonly recovered from metalworking fluids. Despite brief exposure to extreme temperatures at the tool-work-piece interface, metalworking fluids do not normally achieve bulk temperatures sufficient to control microbial growth. In fact, in most systems the bulk-fluid temperatures are optimal for growth. A number of bacterial species commonly found in metalworking fluids grow at pH 9.2-9.5. Like the facultative anaerobes which create micro-environments for the anaerobes, these pH-tolerant bacteria create moderate pH environments for pH-sensitive microbes. Microorganisms create "micro-environments" in which conditions may be very different than they are in the bulk fluid. These micro-environments are protected from changes in coolant temperature, chemistry and pH by the slime, or glycocalyx matrix that the microbial population produces. In terms of pH, this means that even though a coolant may be maintained at pH 8.5-9.0, the pH within the microenvironment may be below 7.0. PH control often affects symptoms rather than the underlying problem of microbial growth. In summary, uncontrolled microbial growth can create problems ranging from gross odors and slimes to more subtle effects on coolant performance. All microorganisms require an energy source, nutrients, and a suitable thermal and pH environment. The essence of coolant system management is optimizing operating conditions while keeping the environment of the metalworking fluid inhospitable for microorganisms. Worker health and safety considerations are of paramount importance in this equation. Although it is beyond the scope of the present discussion to delve into health and safety questions associated with metalworking, a couple of points should be stressed: Metalworking fluids are complex mixtures of chemicals which are constantly changing due to the chemical, physical and microbiological factors which typify metalworking systems. Moreover, elevated concentrations of potentially pathogenic microorganisms are occasionally recovered from aerosols in metalworking plants. The risks posed by these conditions are understood only poorly. The existing data suggest that good personal hygiene and health care minimize the risks due to coolant exposure in metalworking shops. People who have good personal-care habits do not seem to be at any greater health risk than any other portion of the general population.